Ever hear the phrase, "Sometimes it's better to be lucky than good"? I was in Mexico with my family in search of Bonefish, Permit, and Tarpon in December, 2010. It had been a long day of saltwater flats fishing with nothing to show for it but a little too much sun. I'm not sure I'd taken a single cast all day because it was all spot fishing, and besides for the occasional stingray darting away from the small skiff boat, there was basically no excitement. My brother was seated behind me while the guide stood at the back of the boat, using a large wooden pole to push off from the shallow ocean floor and move us slowly along in search of fish. Sometime in the late afternoon, as we moved through a wide murky channel surrounded by mangroves, we spotted a giant fish slowly swimming away from us. From the size of the fish, I thought it was a Tarpon, but the guide quickly identified it as a Snook. 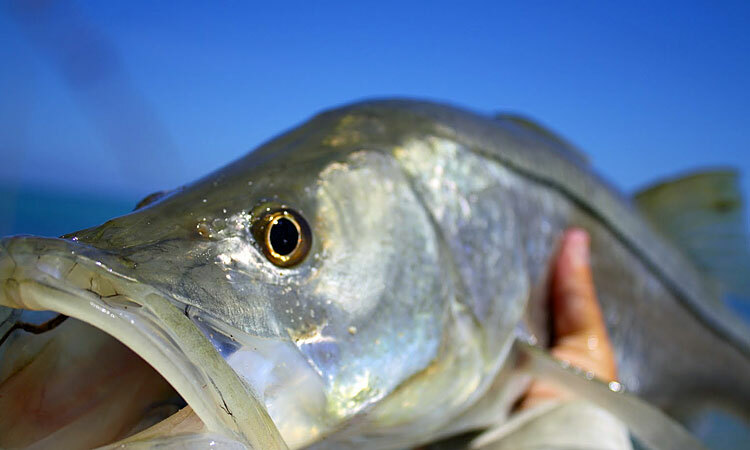 And from the look of excitement and shock on his face, I could tell this wasn't your average Snook. The rod I had in hand had a smaller fly on it, something along the lines of a Crazy Charlie, and was intended for bone fish. In broken English, the guide was able to communicate that we needed to switch rods. He passed me a different rod with a much larger fly - probably 4-5 inches in length, and I handed the other rod to my brother. The fish must've been 60+ feet away and slowly swimming away from us - a cast that I wasn't terribly confident about. I took out as much line as possible, doing my best to not get it tangled at the base of my feet. Then, I began my casting. My double haul skills at the time were fairly nonexistent, but I knew that if I got enough line in the air and shot it out properly, I could at least get it in the general area of the fish. After several false casts, I finally shot the line forward and let it fly with as much precision as possible. 1. I don't think I was capable of making a cast of that length at that time, especially under that pressure. 2. Based on the where the fish and boat were, the only way to place the fly in front of the fish would be to land the cast and line directly over the fish which was swimming very close to the surface - this would likely result in spooking the fish. Regardless, that was the best plan I could come up with in the short period of time. I knew my chances weren't good, but at least I had a chance. As my fly flew forward toward the fish, I watched in horror as it fell a good four or five feet short of the intended target. My immediate instinct was to quickly strip in and try another cast, but before I could, I watched in amazement as the fish slowly turned its body and made a full 180 back toward my fly. My heart was pounding. I had already accomplished more than I thought I would in getting the fish's attention without spooking it. Now, the fish began slowly meandering its way back toward my fly. "Strip!" the guide hissed with a thick accent, somewhere between a yell and whisper. I stripped my line in, and the fish continued to follow the fly. My heart was racing even faster. Before I knew it, the fish opened its mouth and there was a tug on my line. The fish had grabbed the large fly and against all of my trout fishing instincts, I successfully strip-set the hook in the fish's mouth. Even after I hooked the fish, I kept thinking it would end up on my list of the ones that got away, but luckily, after what seemed like a fairly quick fight for the size of fish, the guide was able to net it successfully. I think the shock of catching the fish was pretty evident on my face, and that is a memory I will never forget. I can't say this was a fish that I deserved to catch, but fly fishing is strange like that. Sometimes you make the perfect cast and have nothing to show for it. Then every once in a while, like the time I caught that Snook, things don't go as planned but you still land the fish. Whether you're lucky or unlucky, the only way to ensure you have a chance is to keep on fishing.